The Teddy Tin is a wonderful gift to give all year round. The petite tin, filled with 100g of Chocolatier Milk Chocolate Speckles, is a sweet token gift or ideal for concealing a gift voucher. ​No wrapping required - it's ready to give at a moment's notice! INGREDIENTS: Sugar, Cocoa Butter, Full Cream Milk Powder, Non Pariels [Sugar, Tapioca Starch, Glazing Agent (903), Colours (102, 110, 122, 123, 124, 133)], Cocoa Mass, Emulsifiers (Soy Lecithin, 476), Flavour. Milk Chocolate (80% min.) contains Cocoa Solids 34% min & Milk Solids 20% min. 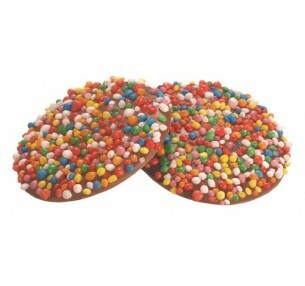 Chocolatier Speckles consist of a large thin milk chocolate disc smothered in colourful hundreds and..